Horses are just like us, they have jobs and daily activities that can cause muscles to become tight and cause pain. Repetitive motion or standing in a stall can reduce the range of motion in the horse’s body. 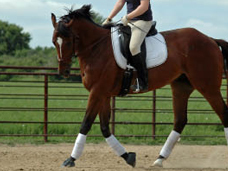 This reduced lack of motion combined with pain can cause the horse to misbehave, buck, rear or bite. Often, pain is primary reason behind bad behavior in horses. Massage therapy breaks up adhesions and loosens tight muscles thus increasing blood flow into the area bothering the horse. Waste materials, think lactic acid, are flushed out, oxygen and nutrients are rushed in. This reduces pain, increases range of motion and heals tissue faster. Bad or dangerous behavior is reduced and performance is increased. All of which makes for a happy horse owner and rider. Horses by nature are prey animals. In their minds they must be on constant vigil for predators, like that scary yellow flower or paper bag on your tack trunk. This constant vigilance is also a factor in disrupting a horse’s rest in new settings, like portable horse show stalls. Massage addresses the nervous system and calms the horse. A calmer nervous system aids digestion which reduces the chance of ulcers or colic and increases the digestion of nutrients. Often, you will see your horse during a massage session lower their head, close their eyes and droop their lips. This tells me the horse is calm and feels safe to let his guard down. And, that he is thoroughly enjoying his treatment! Massage helps your performance horse in many ways. Just like a human, when a muscle, tendon or ligament is under stress, micro tears occur and waste material builds up forming adhesions. Deep tissue work releases muscle fibers that have become stuck together or in a permanent state of contraction, thus increasing balance and efficiency of movement. Myofascial release targets the fascial sheaths, or connective tissue, that surround each muscle and tendon. Injury, chronic stress or poor diet can cause the fascia to dry out, lose its elasticity and ability to glide. This in turn contributes to limited range of motion, imbalance and pain for your horse. Regular treatments keep the fascia supple and healthy, reducing the chance of injury. I am trained in Swedish massage, Deep Tissue, trigger point, myofascial release, cranial sacral and lymphatic drainage techniques. All can apply to your horse and I use whichever technique need at the time of treatment. Pre and post event sports massage increases circulation in the body, moving out waste and moving in nutrients and oxygen to aid performance and increase recovery. I advise horses receive massage every 3-4 weeks while in competition. 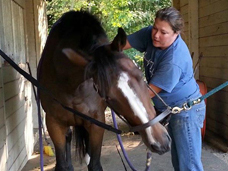 I will work with you and your trainer to customize a plan for your horse. I took my first riding lesson at the age of 6 and spent 13 years in 4-H which gave me a firm grounding in safely handling horses. Along with my twin sister Kathi, we did both English and Western styles of riding. I have competed with and worked in A rated Hunter/Jumper barns. After my parents bought my first OTTB, Robinterry, I have had a life long affair with Thoroughbreds. Currently, I enjoy working with Thoroughbreds off the race track preparing them for new careers as sport horses. How Do I Know My Horse Needs Massage? Shifting his weight from one hind leg to another while standing. Excessive tail wringing or swishing. Stiffness coming out of the stall or just starting under saddle. 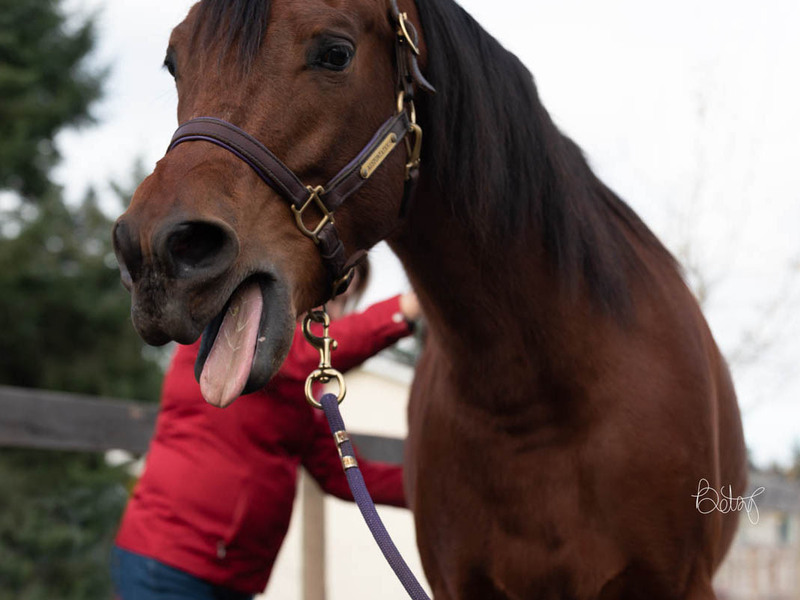 Cranky behavior in a normally sweet horse. Reluctance to perform it’s job (i.e. stopping at jumps, resisting collection, swapping leads). I prefer the owner or trainer to be present the first time I work on a horse, so they can answer questions, show me how the horse moves. If that is not possible then as long as I have permission to be on the property and handle the horse then I can be there with out them. Intake and payment will be discussed over the phone. Stable owners contact me so we can set up an appointment for me to come. I will help you with scheduling and promotion ideas. I can also bring my massage chair to work on your two legged clients.